Sagittarius — a sign of freedom, the boy is ready to tirelessly explore the world around him. Parents must accept that the son is always busy with something. To sit still for a few minutes is an impossible task for the boy Sagittarius. He is attracted by a thirst for adventure, which he can find even within his own room. A restless toddler has a rich imagination. Boy Sagittarius is full of energy, always in good spirits. The guy has the ability to subtly notice interesting details. He knows a lot of interesting facts, with pleasure shares his observations with others. A talented narrator is always in the spotlight. Sagittarius is the leader in any company, even among unfamiliar people. Sagittarius is a fire sign, whose representative has qualities: perseverance, impetuosity, self-confidence. Sagittarius boy is sharp minded. He hastens to learn all the secrets of the world, he often lacks patience and endurance. Parents can accidentally discover that the kid has learned to read independently. The secret is simple: the boy was tired of waiting, when my mother will find time to study with him an interesting book. Boy Sagittarius never falls into despair, he will always find a lesson for himself: learning a huge puddle, reading an encyclopedia, communicating with children. He is distinguished by the desire for movement, the guy can not sit around. Sagittarius boy has an enviable confidence in his abilities, does not even doubt that he will achieve success in any field of activity: trade, science, pedagogy, medicine. Sagittarius is an optimist, always set to win. Positive thinking and irrepressible energy help him move forward. The element of Fire gives him the ability to be inspired. The boy believes in success so much that he does not see obstacles to the implementation of the most daring plans. Parents should support the positive attitude of the son, do not convince him, intimidating with failures and defeats. The boy has such a rich imagination that he can believe in the impossibility of fulfilling his dream. As a result — a depressed, dull boy, devoid of interest in life. The Sagittarius gives each of his actions a certain meaning. The kid is not just busy playing with peers, he learns to analyze information, develops leadership ambitions. A boy, keen on sports, is only set up for prizes. Otherwise, he sees no reason to participate in the competition. The Sagittarius sets himself ambitious goals, he believes that he deserves the best. A guy with a strong character and business acumen easily achieves his plans. The only obstacle is impatience, he must immediately see the fruits of his labor. Sagittarius is sorry to waste time waiting, he can cool down to work, without waiting for the result. At the same time he will quickly find a new, more interesting, occupation. Sagittarius is so fond of freedom that he is not used to restrain himself in desires and spending. The boy does not allow even a shadow of doubt that he may find himself in a quandary. He without hesitation gets involved in any adventure, easily spends money on any nonsense. In adulthood, he can get carried away with gambling. The Sagittarius easily squanders its energy on entertainment and questionable matters. He is so easily carried away that he can not stop without achieving the desired goal. At the same time, the boy can not be accused of laziness, with commendable persistence is engaged in useful things: cleaning, study, sports. Parents are required to teach their son to properly calculate their strength. A separate point — saving, the boy must be able to treat money carefully. Sagittarius is good-natured, good for all people around. He never envies someone else’s success, he himself can reach any top. The guy is always ready to help, even if it’s words of support. The boy is touchingly cared for by younger brothers and sisters. Loves to fuss with homeless animals, parents should not scold him for such a kindness. Sagittarius is a welcome guest in any company, it is loved and appreciated for its qualities: cordiality, compassion. Do not be offended if he finds out that his kindness is used to achieve selfish ends. The Sagittarius knows how to forgive, he is free from heavy grievances. Little Sagittarius is a restless kid, parents should closely monitor him. The thirst for adventure is so great that the child does not notice any obstacles before him. The boy is absolutely devoid of fear, sees everything as an excuse for fun. Most of all the kid likes traveling and walking in nature. It is vitally important for him to lead an active life, in a confined space the boy will quickly wither away. In his school years, Sagittarius is a favorite of his classmates. He enthusiastically participates in school amateur performance and sports. Educators are supportive of the behavior of a mischievous boy, his good jokes can defuse the most tense situation. In this case, often scolded negligent student for restlessness. A sharp-witted boy may not be able to learn due to his unstable nature. Parents should send their son, he needs to clearly know the purpose to which he is going. In this case, Sagittarius will show persistence and diligence. In adolescence, a young man can lose his positive attitude. Failures in personal life, too busy schedule of lessons — causes of nervous exhaustion. A guy can get tired of a rich lifestyle, close up in himself, temporarily leave his friends and numerous hobbies. Usually the active guy will start to seize their problems, the result is excessive completeness. Parents should encourage any insane ideas of the son, for him the main thing is new impressions. 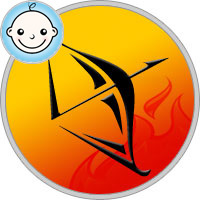 It is important to give freedom to the boy Sagittarius, parents should gently control his life. The guy does not accept any restrictions, he can lose optimism and love of life. The boy is very attached to close people, he loves them endlessly. He has an excellent character, parents should only teach him patience and economy. Otherwise, there is no cause for concern.